There are a lot of ways to blow through $5,000,000,000. Apple supposedly spent that much building its new Apple Park campus, while Samsung says it figuratively (and literally) will burn through that much capital in the aftermath of rushing its flawed Galaxy Note 7 to market and then pulling it off shelves in one of the worst operational catastrophes in the history of the smartphone industry. The iconic new Apple Park complex, introduced as "Campus 2" by Steve Jobs in 2011, was originally slated to open in 2015. It's now preparing for initial employee occupation in April, just days from now. Halfway through the project, in 2013, Bloomberg reported that delays had pushed the overall price of the project to (ostensibly) $5 billion, blaming various details including its expansive use of curved glass as a hallmark of its architectural design. At the time, Peter Burrows wondered out loud to his Bloomberg audience whether critics--particularly Apple's investors--would ask whether "curved glass is the best use of funds," as if Apple were down to its last few dimes and was vexed with a fish or cut bait problem, or perhaps it was nearing the point where it would need to gnaw on its left hand to sustain itself. Dire handwringing about the guestimated expense of Apple's new campus became a common theme for pundits, who frequently waxed lyrical about the prospect of Apple--in its vain hubris--overbuilding a grand facility that it subsequently couldn't afford to maintain in its doomed future, just like so many big old corporate dinosaurs before it--none of whom ever sat on $230 billion. A year ago, Larry Light wrote for CBS Moneywatch of the "curse of the edifice complex," citing skyscrapers built by companies that presaged a major economic decline. Light specifically cited IBM's 41 story Manhattan skyscraper built in 1983 and Chicago's massive 108 story Sears Tower built in 1973, while also providing a counter example of IAC/InteractiveCorp, which "opened its gorgeous Frank Gehry-designed building in New York in 2007, right before the Great Recession," although "IAC shareholders have done very well over past years." IBM, despite being described by Light as having "retreated from computer making and shrank as a presence in the tech world," has actually grown dramatically since it built its "edifice." After ten years of stock price declines in the 80s that halved the value of its shares by 1994, IBM has since appreciated by 1088 percent. Neither trajectory seemed to be related to owning fancy offices. And despite foisting its "computer making" upon China's Lenovo (which has not done particularly well as a PC maker since, and is worth a third of IBM), Big Blue is one of the largest global technology firms in the world--and a major partner of Apple in building new mobile workflows for clients including JAL and Banco Santander. The people most concerned with how Apple is spending its money don't seem to even know how it's spending its money. 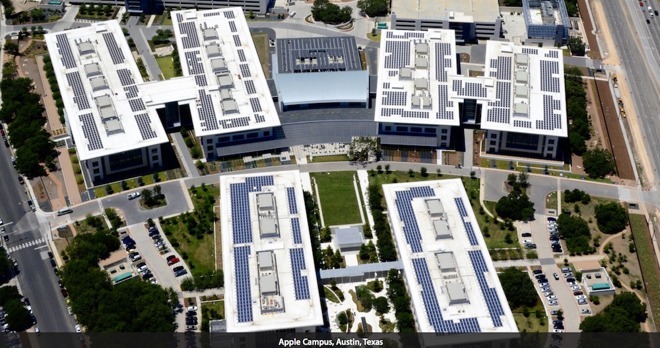 With all of the feeble attempts to link Apple Park construction with certain doom in an embittered sort of schadenfreudewunsch, it's easy to forget that Apple has also begun building a third very large Sunnyvale campus (with far less attention), has nearly completed a massive 1 million square foot Americas Operation Center in Austin, Texas (below) and is operating a San Jose, California chip fab for some unknown, very secretive functions, flanked by nearby development sites capable of hosting a fourth major Apple campus in the Bay Area around 101 Tech, directly north of the San Jose airport, where Apple could build another 4 million square feet of office space. Apple has also leased a million square feet of office space in the Broadway Trade Center in Los Angeles, California and operates what is believed to be a GPU Design Center in Melbourne, Florida near Orlando, as well as having built out a 1.3 million square foot iCloud data center global command facility in Mesa, Arizona. If we are keeping track of expenses to determine if Apple can afford this stuff, keep in mind that the Mesa facility cost around $2 billion and directs the activities of four multi-billion dollar U.S. iCloud data centers in Maiden, North Carolina; Reno, Nevada; Prineville, Oregon and Newark, California. Don't worry too much; the Services businesses those iCloud facilities support (including Apple Music and the App Store) helped bring in $7.2 billion in high-margin revenues just in the last three months of 2016. In addition, Apple has opened new software development centers in Brazil, Italy and India; and built out multiple other research centers including the Zhongguancun Science Park in Beijing, China; a technology development center in Hyderabad, India; three silicon-related research and development sites in Herzlia, Ra'anana and Hafia, Israel; a health and materials-related research facility at the Tsunashima Technical Development Center in Yokohama, Japan; a top secret production lab in Longtan, Taiwan; a Siri voice research lab in Cambridge, England; an apparent automotive research site at Kanata Research Park in Ottawa, Canada and a camera optics research facility in Grenoble, France. It also has started work on a new research and development center in Shenzhen, China. That "$5 billion" Apple Park though! In all, Apple is now spending around $13 billion per year on capital expenditures, which includes spending on its own facilities and the installation of specialized equipment in the factories of its suppliers. In fact, the largest driver of Apple's capex is product tooling and manufacturing process equipment, investments made to ensure the delivery of a massive supply of future products. About a quarter of the total is devoted to expanding iCloud data center capacity driving Services growth. Apple isn't spending that much money on edifice erection. It's spending most of its money on production capacity so that it can build enough products to meet demand. That's currently one of Apple's largest issues, which is why it can't make AirPods--and its most expensive iPhone 7 Plus models--fast enough. Samsung also spends billions on capex, most of which (90 percent, according to the company) is devoted to component research. Of the $22.5 billion Samsung invested last year, about $8.8 billion went into its display panel unit, and $11.8 billion went into its semiconductor group (mostly into memory). 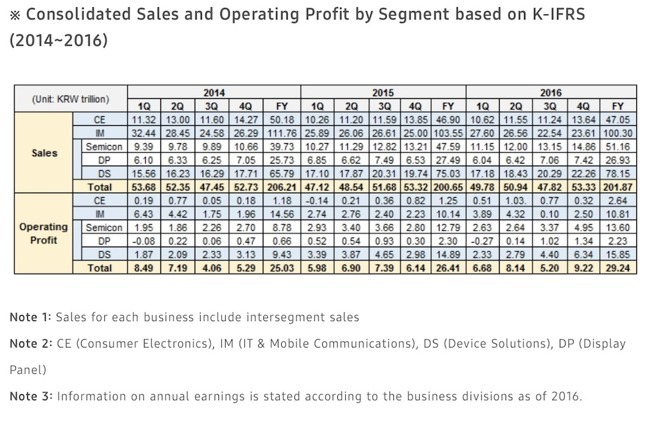 Samsung brought in operating profits of nearly $26.2 billion last year, $9.7 billion of which came from Samsung Mobile, making phones, tablets and PCs in a business unit comparable to Apple--which, incidentally, reported operating profits of $60 billion in fiscal 2016. Apple pays more taxes than Samsung, but its pre-tax profits from phones and other computers are over six times that of Samsung. While Samsung is investing tens of billions of dollars into developing memory and displays, it's making most of its money (about two-thirds) selling those components to others, rather than selling finished goods like smartphones (or washing machines). So it's a real problem when those other things start exploding into flames that burn the company's reputation among consumers. What's $5 billion to a big company like Samsung? Losing $5 billion on the Galaxy Note 7 bonfire (that's Samsung's own estimate) has been happy-faced by a variety of industry flacks tasked with blacking the red and upping the down. "Samsung has emerged from the ashes of the Galaxy Note 7 debacle in pretty good shape," cheered Sherisse Pham in a rosy article for CNN, in one example. But imagine if Samsung had instead built its own Apple Park, then obliterated it in a thermonuclear accident caused by negligence. Would that have qualified as an "edifice complex," and would Bloomberg have wondered aloud if investors considered such a disaster a "the best use of funds"? Research by Fluent was repeated by many blogs to suggest that the damage caused by Samsung's Galaxy Note 7 wouldn't have much impact, noting the finding that "63% of Samsung phone owners said that the Note 7 recall had no impact on their likelihood to purchase a Samsung phone in the future." Jacob Siegel, writing for BGR, suggested "the company might not have much to worry about," under the headline "Samsungs Note 7 disaster wont stop people buying the Galaxy S8," as if the situation were binary. The way numbers actually work means that Fluent's data indicates that 37 percent said it would have an impact on their buying decisions. And 14 percent specifically "said they have safety concerns about the Samsung Galaxy S8," despite being an unrelated design. That's not good. Samsung's "recovered" smartphone sales last year were still down 25 percent from 2014, the year Samsung's growth got kneecapped by iPhone 6. Even a few percentage points of lost sales due to Note 7 fires--and the way Samsung handled them--would shave off premium phone volumes that contribute much of Samsung Mobile's profits. The Fluent report also noted that "only 58 percent of Samsung owners say they are likely to purchase another Samsung as their next phone," contrasting with 89 percent of iPhone owners who said they plan to buy another iPhone. Good thing Apple is massively investing in iPhone production capacity.